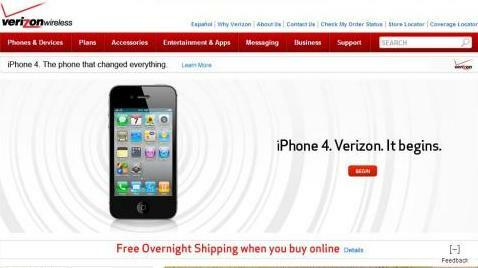 It's Official: Verizon Has The iPhone 4 : The Two-Way The wait is over. Verizon Wireless just officially announced that it too now has the iPhone, ending AT&T's exclusive deal with Apple. The online ad many have been waiting for. The wait is over. Verizon Wireless just officially announced that it too now has the iPhone, ending AT&T's exclusive deal with Apple. CNet News is live-blogging the event here. As we said earlier, All Tech Considered has lots of answers about all this. Update at 11:18 a.m. ET: CNet says Verizon Wireless' existing customers will be able to order the phone starting in early February. Prices: $199 for 16GB and $299 for 32GB. Two-year contracts required.